In mediation, those involved in a dispute or difficult situation are considered to have 'ownership' of it and this means they also own the responsibility to resolve it. The mediators are not involved to resolve the problem for people but to help them to resolve it for and by themselves. This concept challenges a common phenomenon in attempts to resolve conflict known as the 'Rescuer Syndrome'. This page on Ownership is the longest on the site but perhaps the most important, so settling down with a nice cup or glass of something may be a good thing to do at this moment. In many disputes, those involved have a belief that someone else will solve the problem for them and in the field of neighbour disputes, for example, there can often be highly unrealistic expectations of the Police and local authority officers to ‘take action’ against a neighbour with whom someone is in dispute. Often, the amount of time and energy put into trying to persuade these agencies, as well as their local MP’s and Councillors, that their neighbour is ‘in the wrong’ is enormous and hence when they find that the neighbour has not actually broken any law or legislation, they feel a sense of despair and injustice and anger and frustration and various other emotions that arise when people believe they are powerless to bring about change in a situation. This anger and frustration is often expressed as criticism of the Police or the local authority or some other agency that they expected to solve the problem for them. They have abdicated their ownership of the dispute and formed a dependence on the agencies to resolve the situation for them. What they often do not consider or even believe is that they have the capacity to resolve the situation themselves and that the time, emotional, and sometimes financial investments they have made would have been far more productively used in doing so. In many cases it is only the parties in dispute themselves who can resolve the situation. I am obviously not talking about the situations where there is clear one sided malicious action taken by individuals or groups which are a clear breach of the law such as continual vandalism of a property, music continuously played loudly in the early hours of the morning, serious physical assault, etc. Ownership of these situations is defined by laws to be that of the relevant authorities. But situations such as parking disputes, noise which is not a ‘statutory noise nuisance’, mature hedges that do not breach any regulations, children playing football in a communal area and many others besides are usually not examples where any agencies can take action against any party. Hence, all that can really be said about the situation is that those involved do not ‘get on’, and because of this, have not been able to communicate effectively enough (or at all) in order to resolve their dispute. That is basically what it boils down to. Some outside observers may say that one party is ‘morally’ wrong even though no law is broken. And of course, the parties in dispute themselves believe this. But unfortunately because of the subjectivity of ‘morals’, it could just as easily be said that the other party is ‘morally’ wrong and so this doesn’t get anyone very far and instead provides more polarisation, involves more people and ultimately, less chance of resolution of the dispute. If these outside observers are 'allowed in' by those actually in dispute, their feeling of ownership of their situation is gradually diluted. This intervention by others taking sides or 'supporting' those in dispute, can be a major obstacle to resolution of the dispute. See also the pages on Impartiality and the Rescuer Syndrome. A man is disturbed by noise from a neighbour playing music at 8pm in the evening. It stops him enjoying Eastenders on the television and he believes his neighbour is being inconsiderate, or perhaps, to use more recent phraseology, he is exhibiting ‘anti-social behaviour’. This has occurred on more than one occasion. When it first happened he thought it would be a ‘one-off’ and so didn’t say anything. When it happened again he started to get a bit concerned but thought maybe it was a phase his neighbour was going through. However, it has now happened about 10 times and he is starting to lose track of the plot line in Eastenders and every time he comes home he is tense in case the music starts again and he is really starting to get angry. Tonight is the last straw. So he goes round to his neighbour and thumps loudly on the door and says to him "For God’s sake what is your problem? Why can’t you turn your bloody music down? What is it with you people that you have to have it so bloody loud?" So just try to imagine sitting at home enjoying your music and someone turns up at your doorstep and says that to you. What would your feelings be? How would you respond? Who is in the ‘wrong’ here? It is unlikely that the music would be considered a Statutory Noise Nuisance at 8pm unless it was incredibly loud (which in this instance it wasn’t, for the purposes of the example), and up until he opened the door to his neighbour the music player was not aware that he was disturbing him. So is the music player in the wrong for playing his music, or is the angry neighbour in the wrong for being so aggressive in his contact with the person? We can all take a moral standpoint on this and could probably spend hours debating it. It’s quite likely that those of us who have been disturbed by loud noise would side with the Eastenders fan, and those of us who don’t like verbal confrontations would side with the music player. But this would just be us bringing our (irrelevant) previous experiences to this new (totally different) situation. Our very act of taking a standpoint is seeking to take ownership from those involved, as if the dispute is a recreation of our previous experiences. Which it is not. But it would all be hot air in the end because no agency would be able to give an ultimate ruling on it. At the end of the day, the only people who will be able to resolve this are the people themselves. Ownership of the situation is theirs. Their actions created it and they are ultimately responsible for the responses they give and the consequences (for themselves) of their actions. But what often happens in such situations is that the music player may call the Police if he feels intimidated, or he may be aggressive in return and a tennis match of insults will ensue or even a scuffle. If the Police are called - and I am not saying they should not be if someone believes an illegal act has occurred, just that it may not prove to be so - simply calling the Police does not make the act illegal- the Police will listen to what the music player has to say and will then go and speak with the Eastenders fan. They may advise the Eastenders fan that if his behaviour was aggressive he would be at risk of breaking the law and the consequences of this. However, given what he said to the neighbour, even if there were witnesses, it is highly unlikely they would be able to take any action as it would not be serious enough. The Eastenders fan would, of course, protest at the injustice of it all and say that he was driven to it by the anti-social behaviour of his neighbour in the form of his music and would ask what are they going to do about that? In making such a protest he is abdicating ownership of his actions and their consequences. The Police may advise him of the availability of the local authority Noise Patrol who can decide if his neighbour is breaking the law – which, while a correct and appropriate response in case it is an illegal level of noise, continues to add to the number of agencies and time and resources involved in the matter. When he is again disturbed the Eastenders fan will phone the local authority’s Noise Team who will inevitably turn up when the music has stopped. This is not a criticism of Noise Teams – what is often described by neighbours as ‘constant noise’ often lasts for periods of about one hour and so by the time Noise Teams arrive the music has stopped. They can’t teleport to the place in an instant!. This in turn may cause the Eastenders fan to write to his MP or local Councillor to say how ‘useless’ the Noise Team are and also to complain about the bias of the Police in such a clear situation of anti-social behaviour towards him. The MP or Councillor will do an investigation and ask the Noise Team Manager to report to him why his team did not attend in time to hear the Noise. The Noise Team Manager will ask the team member at the time to do a report about the situation explaining why he didn’t report the noise as a Statutory Noise Nuisance. The team member will look to the heavens and write a report knowing that nothing can be done in the case as no evidence of legislation being broken is present. Unfortunately what sometimes can happen is that the case is reopened and stays open just to look like something is being done as this allows a response of 'the situation is still being investigated' to anyone who enquires, rather than have to go through a tedious and unnecessary complaints procedure. On hearing this, the neighbours involved continue to expect outside agencies to 'solve' their problem and don't look to themselves to take ownership of the situation. One of the main reasons we hear for not taking up the offer of mediation in neighbour disputes is 'It's with the Council'. Sometimes it has been so for years with no change. An enormous amount of resources and time and energy put into the incident. However, the only people who will ever be able to resolve this situation are those neighbours themselves. Those who have ownership of the dispute, whether they recognise it or not. See also Communication and Conflict in the Helping Professions for further discussion of this particular area of dispute situations. And this ever more complex web of interactions and escalations and new players in the drama is replicated in countless destructive conflict situations whether it is in the Middle East, or workplace disputes or complaints about Health practitioners, or between pupils in schools. You name it, there will be a lack of ownership by the main protagonists, not always because they don’t want to use the ability they have to resolve the situation, but just as much it is because the involvement of others, who are ultimately powerless themselves to resolve it, distracts them from the fact that they can. Look at the situation in Iraq that exists as I write this and just recently more American troops have been sent out there, while at the same time there are complaints that the Iraqi Government are not doing enough to take responsibility themselves. Two contradictory actions – the more troops that enter their country from a foreign power the less ability those directly involved will have to take ownership. The only caveat to this would be if the troops sent out were under direct control of the Iraqi Government, in which case they would be the decision makers about what happens in their country - but I don’t think that would be very likely to happen. Consider for a moment what it would be like if we had, in Britain, a force of thousands of troops from another country, operating semi-independently of our Government’s wishes, walking our streets. Would we feel a sense of autonomy and ownership? I’m not wanting to get into a ‘bash America’ routine here as I am saying that we are all capable of following a similar path in our own local situations whether as parents, or Teachers, or Social Workers, or bosses or Police Officers or Journalists, in fact in pretty much any role we play. The situation in Iraq is just our own personal experience writ large and we could be the Rescuer coming in to 'save' those involved or the 'helpless' Victim. We’ve probably played both roles at times. Only when we see it in ourselves and learn to step back from our Rescuing or Victim tendencies are we in a position to judge, or 'blame' others for their actions in this way. Or, if we do judge them, we have to accept our own hypocrisy. 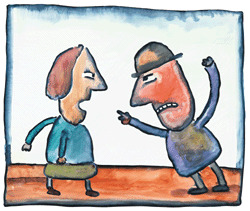 In many dispute situations the main protagonists may not even consider that they have ownership of their choices and actions and have the capacity to resolve the situation themselves. The responses of the outside agencies involved also rarely point this out to them, nor expect it of them, and often distract them from the realisation. Many residents complain that their local Council wastes money and resources through inefficient use of those resources but rarely do they consider how much they cause local authorities to waste resources by not taking responsibility for resolving their own disputes. The Police are also often expected to provide their resources for situations that they have no role to play in. We don't expect the local authority or Police to come and clean our house for us, so why would we think they have a role to clean up our own interpersonal relationship disputes? Let's go back to our two neighbours. If they were to accept responsibility and ownership of the situation and acknowledge their response-ability to deal with it, the neighbour disturbed by the noise could reconsider how he communicated his concerns to his neighbour. Could he have contacted him before he became so frustrated by the noise? Could he have phrased his ‘complaint’ less aggressively? The neighbour playing the music could try to see beneath the aggressive words and comments to understand that his neighbour was saying his music disturbed him and could he turn it down a bit or even play it at a different time, for example, not when Eastenders is on! Only through effectively communicating with each other and acknowledging their ownership of their situation will they be able to effectively resolve it. Only through reflecting on their own actions will they be likely to create different and more effective ways of acting in the future. They own the situation and if they were to try mediation there would be an ongoing expectation of them being able to resolve it themselves and the role of the mediators would be to support them in doing so. It would not be to solve it for them or suggest to them ways in which they could resolve it. That would take away their ownership and prevent them from using their own response-ability and would reinforce their expectation that someone ‘out there’ is going to solve it for them by telling them what to do - when no person or organisation exists that can achieve that, even if some try. To try to solve it for them or suggest to them ways in which they could resolve it would also contribute to the already prevalent suffocation of peoples’ capacities to resolve their own disputes that occurs on a daily basis throughout the world, arising through a lack of awareness of where ownership resides in disputes. The involvement of an outside agency via a complaint by one party often leads the other party to feel a need to ‘even the score’ and so they will also involve either the same agency or their boss or other authority via a counter complaint or will approach a different agency, senior figure etc. about a different matter. This then becomes a repetitive action with more and more agencies or senior figures becoming involved more and more times as the situation persists. It becomes a competitive response to the conflict which is ultimately ineffective. See the page on Conflict as Competition for more discussion of this type of response. Only when one of the parties is driven to act in a way which is unlawful or breaches legislation or a code of conduct etc. will any of the agencies have any genuine grounds to take action. That is they will then have responsibility and ownership of that aspect of the situation. "We cannot take action in this situation, you must resolve this between yourselves – mediation is a means through which you could do this, but whether you choose this or not, further unnecessary involvement of our officers will be subject to a charge of wasting (agency) time". Part of the reason for not making this response is something that has been mentioned already and is discussed in more detail on another page: The Rescuer Syndrome – a lack of belief that people have the ability to resolve disputes themselves nor the expectation that they should do so. This arises from a lack of acknowledgement of the boundaries to agencies’ roles. Agencies ultimately only have power to act where legislation gives them that power. It is only within that legislation that ownership of the situation is within the remit of the agency. What often happens is that Teachers, Police Officers, Housing officers will use the phrase "We have become more like social workers!" to describe the ever expanding role they see themselves as playing. But this is a self-created problem because they are often trying to force, or at least persuade, the disputants to take actions where they have no power to do so, and hence suffer the sense of impotence that inevitably occurs. See the page on Communication and Conflict in the Helping Professions for more about this. I’m not suggesting they do this on purpose. Its causes exist thoughout the structures not only of the institutions that deal with disputes but the outside monitoring agencies and individuals as well. It is intrinsic to the way that most institutions operate. When the parties are continually distracted from acknowledging their own capacity to resolve the dispute, persuasion of each agency or individual involved that they are the ‘good guys’ and the other disputant is the ‘bad guy’ is the main focus of every action. Gathering evidence, calling an agency every time something ‘questionable’ occurs can become an obsession. In neighbour disputes, people are often given ‘noise diaries’ when they complain of noise disturbance. These rarely provide sufficient information to lead to prosecution of a neighbour and in fact often prove that the frequency of disturbance is not as bad as originally suggested. But an outcome of a disputant being given a diary can mean them staying up later into the night than they are used to just to catch a noise ('Neighbour's son went to the toilet at 3.34am and closed door unnecessarily loudly')from their neighbour that they can then write in their diary to pass to their Local Authority Officer or Police Officer. The disputant has handed all responsibility and ownership to the agency for resolution and blindly carries out their directives and advice without considering the possibility of resolving it themselves, nor the potentially worse impact on their lives of doing so than the problem itself. After months of doing this, when the disputant finds that the evidence they have gathered, and all the times they called the agency to complain have not led to any action, they become angry or depressed or various other negative emotions arise in them. This despair and sense of hopelessness arises because they have let go of any thought that they have the ability to resolve it themselves, and feel totally dependent on the agency to do it for them. The impact on the agency involved whether the Police or local authority or other authority is that they are seen as failing or incompetent in dealing with anti-social behaviour, when in fact their main failure was to not manage the expectations of the disputant in a realistic manner. People given noise diaries do not often have explained to them in sufficient detail that their efforts in recording the noise may come to nothing and that they may more effectively spend their efforts trying to resolve their disputes themselves, for example, via mediation or by taking actions themselves that are more effective in their communication of their concerns. Please take a moment to consider any protracted dispute you are aware of. Who are the people at the centre of the dispute, those actually experiencing it? How many outside interventionists are there? Who is it who is stuck? If it's the 'Rescuers', what are they stuck over, it's not their dispute? They will only be stuck if they are trying to control or change others, which, as I said on the Conflict Resolution page is conflict suppression or conflict avoidance - it doesn't work. Are the people actually experiencing the dispute taking ownership through being actively engaged with those they are in dispute with to try to resolve it, or are others doing this on their behalf? Are there others who are making protests on behalf of those involved, claiming to be their ‘supporters’? Are there people making protests on behalf of the other side, also claiming to be their supporters? Are these people now creating their own destructive conflicts? The Rescuer syndrome is the biggest obstacle to genuine conflict resolution and yet its manifestation is often seen as a ‘noble act’ of saving others. Unfortunately this fundamentally assumes that those in dispute don’t have the ability, inclination or capacity to 'save' themselves. And so, instead of saving them it continues to suffocate their ability to respond effectively and take ownership of their dispute. In this way, it escalates the dispute by involving more and more people, organisations, countries, armies in the original situation. A young woman sitting across and to the left of me was listening to her personal stereo. A man standing in front of her asked her to turn the music down – I’d not been able to hear it but he clearly could. I missed much of the initial conversation but it developed into a discussion between them with the man pointing out how inconsiderate it was to play her personal stereo so loudly. Eventually a young man sitting next to me said that he didn’t think she had done anything wrong and so the discussion became a 3-way debate across the tube carriage. Then another man, standing next to the original objector joined the debate, this time agreeing with him and so the debate became more complex. A simple request by the man disturbed by the girl's music for her to turn her music down may have been enough, but the man who objected was saying things to suggest it is ‘wrong’ to play her personal stereo on the tube and said ‘What about other people who use the train, they have to hear it too?’. He spoke for the rest of us when he said this and yet was not mandated by any of us to do so – as clearly evidenced by the man next to me who spoke up in support of the woman. The objector also challenged the person and not the behaviour by calling her 'inconsiderate'. It all ended when the objector and his supporter got off the tube a couple of stops along. However, in the brief period in which the incident occurred there was far more disturbance caused than the personal stereo had caused, mainly because of the ineffective way in which the original objector had communicated his concerns to the young woman, but this was then escalated by the rescuing of the others who chose to become involved, increasing the debate to a full argument and ‘stand off’, ultimately affecting not only those originally involved but also the rest of us in the carriage. I think the situation provides a very good analogy for what happens in many disputes when they are responded to destructively and rescuers also believe they need to become involved in a partial way, to 'take sides' (back to the competitive approach to conflict again). The sequence of events, the actions of the main protagonists, the intervention of the rescuers and the ultimate impact on those who witness the situation are all very similar to what happens in families, in workplaces, in international disputes, in schools, between neighbours and in pretty much any escalating conflict situation you could identify. Unfortunately, in many of them the destructive responses don’t end after a few tube stops but continue to escalate to violence and destruction. So how does this relate to Effective Communication? Well, the above situations show how ineffective communication can break down and the consequences of this, as well as the ways in which the situations are exacerbated by the intervention of outside influences. These reduce further the level of ownership taken by those directly involved in the communication breakdown. •	there is a mutual understanding between those involved (perhaps including yourself if you are thinking of your own situation) that they are willing to make decisions for themselves and quite able to take actions arising from those decisions by themselves. •	All involved have a strong ownership of their thoughts and ideas and actions and very much want this to be the case. •	There will be a strong sense of comfort and confidence in the environment or context within which communication occurs. Think of a trusted friendship, or an excellent working relationship or a successful marriage. The above features will be present in any such situations. •	effort will be put in to persuade outside involvement to take sides instead of acknowledging ownership of the situation or self responsibility and response-ability to resolve it. Most of us do this in situations where we are in a destructive conflict with people. The continuous decline in the effectiveness of the communication occurs because, while we abdicate ownership, we blind ourselves to our own capacity to act differently or communicate more effectively or think differently about the situation,and so we believe we cannot take responsibility. And so it can only continue. And yet in situations where Effective Communication occurs and conflict is responded to constructively we actively choose to take responsibility for these things, even if we are not aware this is what we are doing. Please take a little time to reflect on this distinction between taking ownership and not taking ownership with any examples you can think of where you feel communication is effective or where it is not effective, using the features outlined above to compare the situations. Ok, let me now propose some examples: Consider a workplace conflict where someone is not getting along with another person or group of people. How much time does he/ she ( ….or how much time do you..) spend trying to persuade others of how wrong, unacceptable, offensive, inappropriate, annoying etc. the other person’s actions are? How much effort do they (you) spend stating the motivations for the other person’s actions? •	they fancy the new PA in the Finance Department and just want an excuse to go down and chat them up, etc. All of these are examples of one of the Principles not being practiced - That we speak only for ourselves and speak in the ‘I’, that is, they are ascribing motivations for the other person's actions,(instead of simply asking them what they might be!) as if to say the problem is their fault and arises from their malicious or selfish intent. There is also an attempt to ‘share it out’ by developing allies and fellow conspirators in the situation. This is a way of passing ownership to others. And how often do others (we) get drawn in to try to rescue the person? 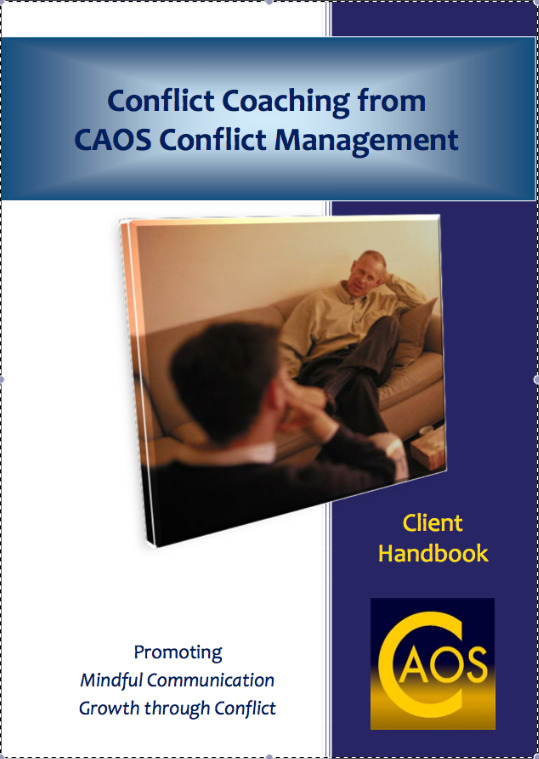 This is a further way in which the conflict becomes more destructive as the others who get drawn in may not remain impartial nor maintain confidentiality about what they hear or know in the situation, both of which are important Underlying Philosophies of Mediation and contribute to effective conflict resolution. These philosophies are reflected in the Principles of Effective Communication. A lot of effort goes into persuading others of the enormity of their (our) victimhood, but very little effort goes into direct attempts at resolution between those involved (us). This is such a common feature of the way we often respond to conflict that it usually goes unnoticed and yet it is a highly ineffective way of communicating our fears and concerns and a destructive way of responding. All of these practices are trying (although usually unconsciously) to pass ownership of the dispute to others. The belief is that it is somehow teaching children 'right' from 'wrong' by doing so, when often it is an uninformed, snap judgement made with little evidence to base the judgement on, nor any clarity over why one child's actions are 'right' and the other's is 'wrong'. Consider some more examples, perhaps now on a more global scale, where this is a feature of what happens when those involved in a communication breakdown cause more destructive conflict to arise by drawing in the (often enthusiastic) outside ‘powers’ to take their side, to try to pass ownership of the problem to them. The justification given by these outside powers for their involvement is that "these people need help", when often the same justification is given by the people who support the other side in the dispute and so the situation can only escalate. The war in Vietnam was substantially supported by outside powers to the extent that eventually Vietnam became a platform for those powers to have their own war by proxy. Ownership was both abdicated and taken away in the situation and it is another example of a common response to conflict situations. I’m not wanting to condemn any of those involved in such situations as it is a common feature of almost all destructive conflicts from neighbour disputes, to family disputes, to workplace disputes to international conflict. We are all prone to doing it in our own situations. I’m making the observation to highlight that this is a frequently unacknowledged behaviour, but through acknowledging it we can identify it and choose to act differently. It’s ok to make mistakes. We can learn from our mistakes. If we choose to. As we come to the end of the section on Ownership, please reconsider the examples you thought of earlier and think about how ownership has been a)	abdicated, and then b)	taken away from those involved in the situation. Please note that it can only be taken away if it is first abdicated, it can’t work the other way round, no matter how much pressure from the ‘Rescuer’ there is to take it. Having reconsidered the situations, and you may have been involved in some of them yourself, consider how those two actions happened and why they happened. •	Why was it that ownership of the situation was given away and not retained? •	How did the Rescuers manage to take over ownership of the situation? The sense of powerlessness of those involved in such situations arises because ownership has been given away. But just because there is a ‘sense’ of powerlessness does not mean that the power to resolve a conflict constructively is not there. It just means it isn’t recognised and acknowledged. Yet. 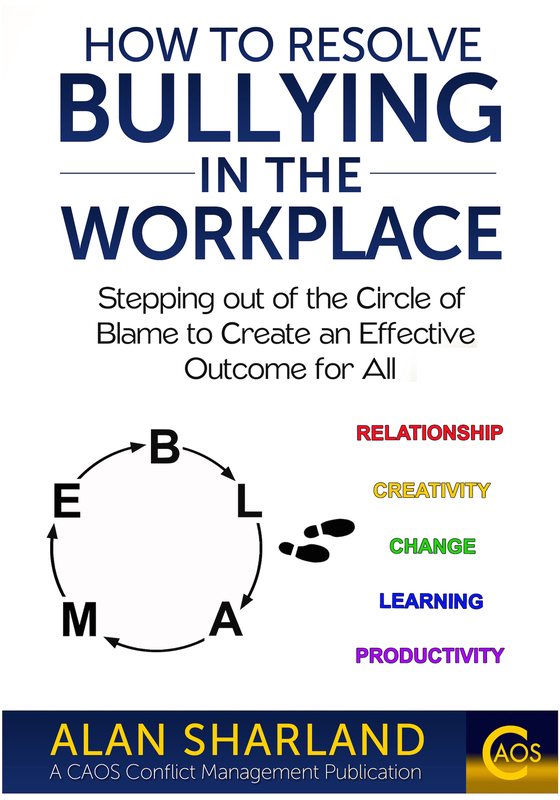 Alan Sharland has written a vital book on bullying. His approach is the way forward. Instead of focusing on 'proving it', which takes us in the direction of investigations and hearings that go no where and only serve to exacerbate an already sensitive situation, he shows the way forward through direct communication and a focus on the behavior that is of concern. At times the support of an internal workplace mediator will help.